Just wanted to come by to say "hello" ... its nice to be back online again. We didn't lose internet, instead its been a busy time of going about and getting movers to move furnishings from my mother's home to ours. We now have a second car, which we have gone without for 7 years. The car is 15 yrs old, but it still is in great condition. My husband loves driving it, while I drive the SUV. ;) Just wanted to give you an update. 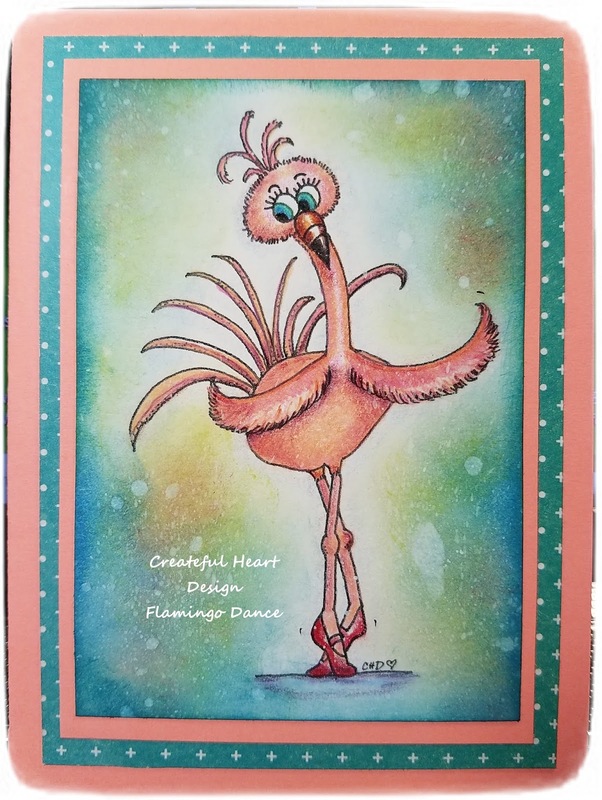 Now for another update for the upcoming Blog Challenges, yes, I have a Createful Heart Challenge Blog would you like to join us?? We have themed challenges, and our next one starts on May 15th at 7:00 A.M., EDT. To find out necessary information on themes, rules, and other info, you will find everything within the blog, look for the Tabs at the top of the menu area. Starting May 15th, we will select 2 Guest Designers to be featured on our Blog. Woohoo! Selections for Top 3 will be selected as well. 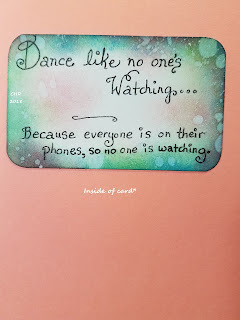 Also, if you like contests, we will be featuring a twice a month "Show Your Craft Space"..beginning on May 2nd, on the Createful Heart Design Face Book Group, find link here; depending on how many actually enter will determine if we have enough to pick 2 winners. It would be lovely to have you join in with us for both of these events coming up!! We would love you all to come by and visit our events coming up, let us get Spring started!! See you there!! Hello! I recently created a card using my Awesome Blossom image. 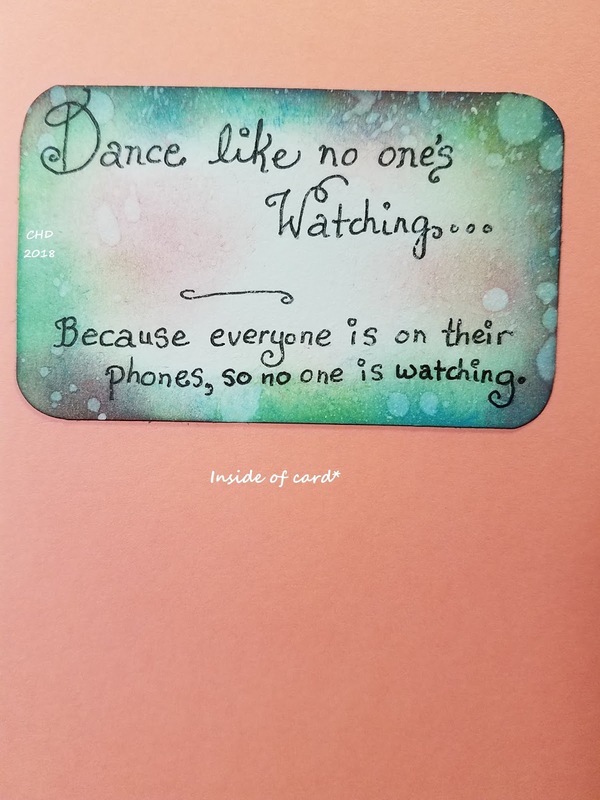 I needed to make a card for a family member, and this is what I came up with. I colored it up using my Ohuhu brand of markers. Glitter gelly roll pens in pinks, purples. And highlights with the white gelly roll pen. I think it turned out nicely. Let me know what you think. To add in some water droplets on the petals and leaves I used Nuvo jewel drops. It did nicely! Anyway, sorry I haven't been on here in a long while, but will try my best to be on here more frequently. I'll see you later, and thanks for stopping by to see my cards! We would love to have you join in with us! 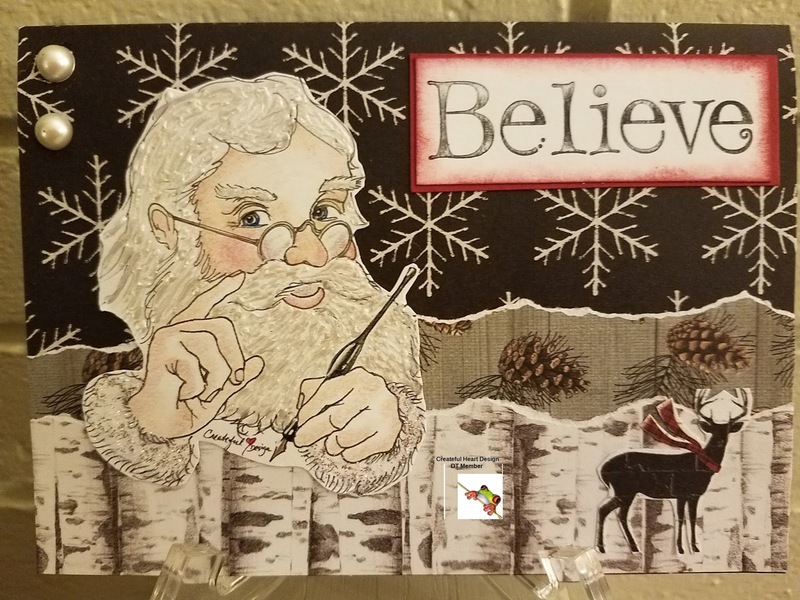 Just wanted to share the card I made for this blog challenge. Created this in memory of my Mother. She loved butterflies. I hope that you will check out our challenge and see our store! On the side note, wanted to say that I plan to make a scrapbook to honor my parents. I'm gathering all the materials for this purpose. I had always wanted to make one, but was never sure of what kind to make. For those of you that didn't know.. last month my Mother passed away. Just a day after her 94th birthday. She lived a long life, a blessed life. She is sadly missed by all that knew and loved her. Well, I'm going to end this post here.. but I am happy to have you come by.. sorry for such a late posting..
Hi everyone, Hope you had a nice Christmas! We enjoyed a quiet time here, just the two of us. We are in the process of painting, and just giving our bedrooms a nice update. And yes, we just started working this evening. Okay, enough about that. I am letting you all know that we are need of at least 2 designers. We have a 3 or 6 month's term. If you would be interested please PM me, here on FB. We accept anyone that has a blog. Experience is not necessary. But, I would love to see at least 3 samples of your work. I will say, working with digital images is a must. Thank you, And I wish you a Very Happy New Year! Hello everyone! You are Wanted at the Monday Greetings Challenge, at the Outlawz! Our Sponsor this week is Sheepski Designs. Here is the Image I chose to create with, Winter Robin. He's a cute little fellow, sitting among the red berries and snow. Jute was added to the bottom of image area, along with a spattering of white acrylic paint for a snowy effect. Sentiment is from Stampin Up. Little black gems were added in along with poinsettias. And last but not least, Tim Holtz frayed burlap oxide was added around the edges of image, and sentiment. 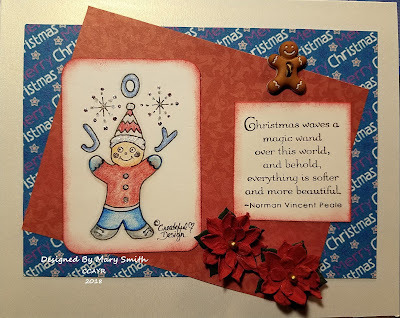 Here is a close up of my card, to show the texture that was added. Hello, everyone! 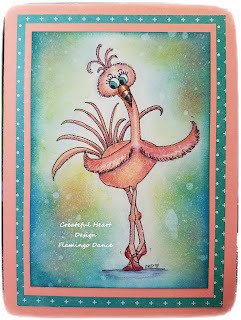 Welcome to my blog, I would like to introduce my newest Image, Flamingo Dance. She is available in my Zibbet Shop. Here is a Link. I didn't have a stamp, so created it myself. 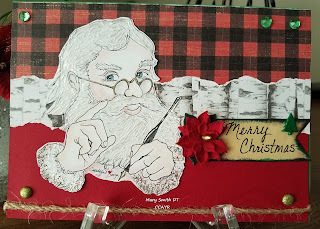 I really love the Oxide Ink Pads, by Tim Holtz. Well, I'm signing off for now, our area is experiencing a bad ice storm... and even though I'm using my cell phone for internet, I can't be sure that it will remain on. Leave a comment if you would like. Hello everyone! We have a Challenge going on over at Christmas Crafts All Year Round, and you're invited! The theme is Gingerbread! I think he is cute, celebrating the Season of Christmas by spreading Joy! I hope that you'll join in our Challenge at CCAYR. 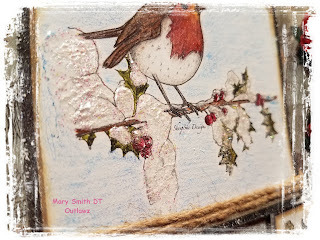 Hi, we're celebrating Christmas - with add a Sentiment over at Createful Heart Design Blog Challenges, here's the link, we would love to have you join in with us. I used the Image: Checking it Twice, this image is available in my Zibbet Store. Perfect Pearls - White Opal, to give the hair and beard texture. Thank you, for coming and having a visit! He's Makin' a List and Checkin' it Twice! Hello and Welcome to my crafting corner.. 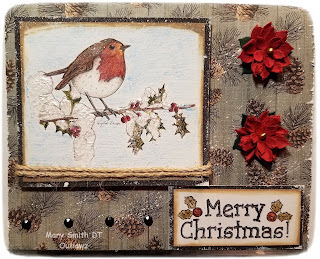 I would like to tell you about my card I have made for Christmas Crafts All Year Round. Its kind of hard to tell if I gave his face any coloring but I sure did. This is my card made with our new digital image, "Checking it Twice". 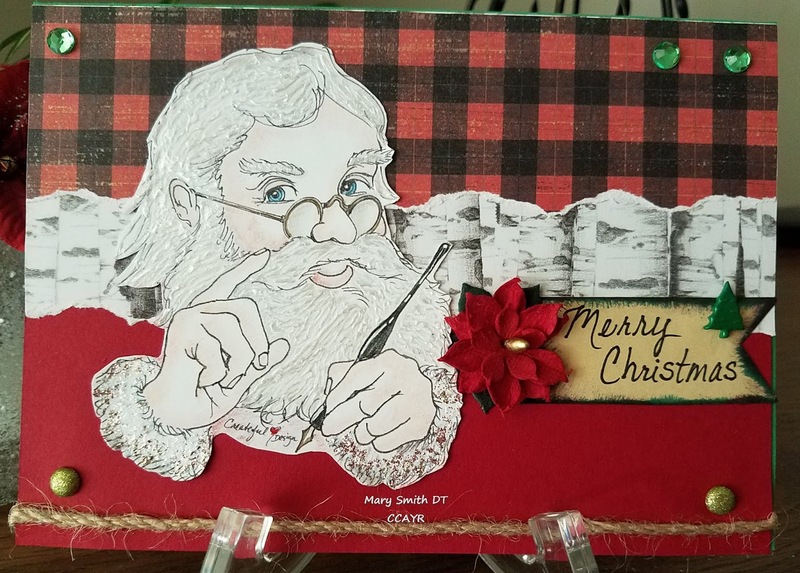 This handsome Santa can be found here. How to make the beard white? Well, I gave that a lot of thought. So, I got out my liquid pearls in the shade of white opal, it wasn't bright white but it worked for what I wanted it to do. Texture. Click on the photo to look more closely. Anyway, I wanted to let you know that CCAYR is having a Challenge. So hope to see you there! 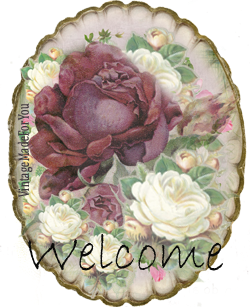 Thanks for coming by to visit my blog.